Join your neighbors for a series of fun, FREE, all-ages events along Minnehaha Avenue on Saturday, August 22 from noon to 4 pm! Enjoy dance performances and learn some new steps — from hip hop to break-dancing to Middle Eastern and drum performances. Performances/instruction will be outside along Minnehaha Avenue at the Fix Studio, Selam Coffee, Sosa Foods, and Adams Triangle. 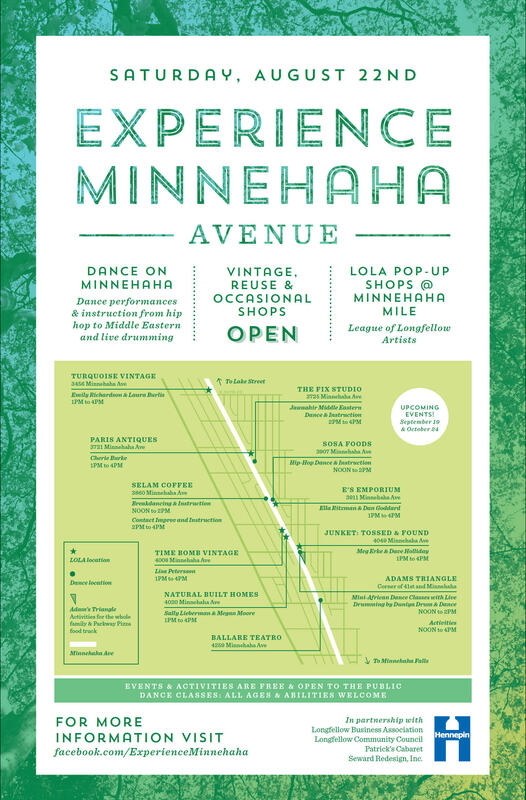 In addition, LOLA will be hosting Pop-Up Shops at 6 vintage/reuse shops along the Minnehaha Mile shopping district. Artists will be in the shops from 1 to 4 pm. Avenue businesses! More information on Experience Minnehaha Avenue activities can be found on the project Facebook page.